Last summer at ESSENCE Festival, Oprah Winfrey shared early in her career she visited a mentor’s house and noticed she had trees in her yard – six to be exact. Winfrey surmised that rich people own trees and, one day, she would own six herself. At her Montecito, CA estate of 65 acres, Winfrey has more than 3,600 trees. Those gorgeous trees are one of the first things guests noticed when they drive through her estate aptly called The Promised Land. 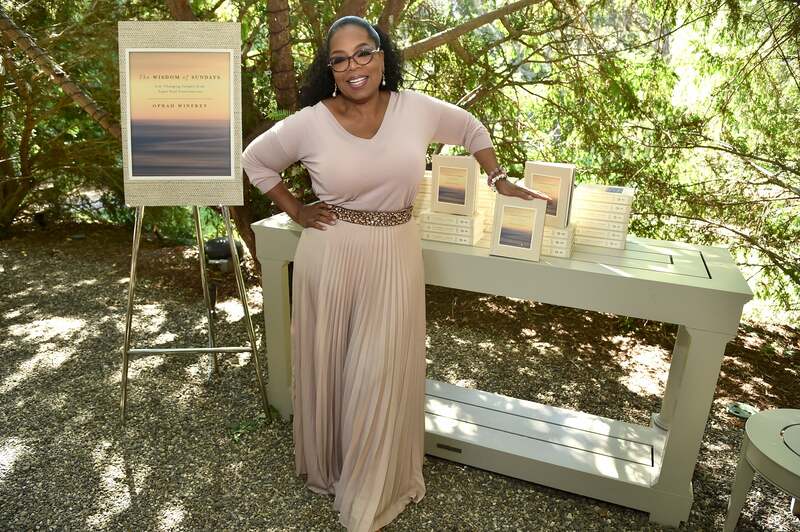 On Sunday, Winfrey invited some of her famous friends and spiritual inspirations for a Super Soul Sunday Gospel Brunch to celebrate the release of her new book The Wisdom of Sundays: Life-Changing Insights from Super Soul Conversations —and the success of her Oprah’s SuperSoul Conversations podcast. As Winans took us to church, the powerful crowd praised. Julia Roberts sat with her husband Danny Moder, near Winfrey and her longtime partner Stedman Graham. Diane Von Furstenberg sat next to Diane Sawyer with Shonda Rhimes nearby and Arianna Huffington holding down the aisle seat. Not seated were Kerry Washington and Angela Bassett who were up rocking and clapping along with the choir. Also in attendance were Amazon CEO Jeff Bezos, Alicia Keys, Usher and many of our faves from corporate rockstar Bozoma Saint John to bestselling authors Janet Mock and Luvvie Ajayi. We also spotted many power couples including DeVon Franklin and Meagan Good, and Mellody Hobson and husband George Lucas. ESSENCE September cover girl Niecy Nash was also there with her mom. It’s harvest time. Get your blessing. I’m heading back to LA for my dear friends’ wedding - from @oprah’s estate. She is celebrating the release of her new book #wisdomofsundays and her dope @supersoul podcast that has been making my commute. And I got to attend her gospel brunch and interview her during a round table in her backyard. And again God reminded me his time is divine and delay is not denial. More details coming soon but had to share. Your breakthrough is always on its way. And love to @gillespie.official for styling me like Cinderella heading to meet the queen! Cynthia Erivo closed out the show with a unforgettable rendition of “Stand” bringing the crowd to its feet. Guests walked to an open lawn reminiscent of eden for Sunday brunch produced by Colin Cowie. The menu offered fried chicken and waffles, a Southern Culture Grits Bar, soul food sides and a seafood bar with mac and cheese a crowd favorite. Soul food was prepared by Chef Art Smith, seafood by Chef Mei and vegan options from Chef Tal. Mini bottles of fresh hot sauce were scattered around the gorgeous garden party place settings. But before a bite was served, Bishop T.D. Jakes booming voice offered grace for the sacred gathering. Want more of Winfrey? Stay tuned for our interview with her and get your dose with her SuperSoul Conversations podcast and the new book Wisdom of Sundays.